Visiting the Samek Art Center, students got a preview of an exhibit of illuminated manuscripts. They also learned about parchment, or paper made from compressed animal skin. Parchment has a scent and a slightly rubbery texture. We all got to feel it, and students experimented with stitching through it, applying their new embroidery skills. 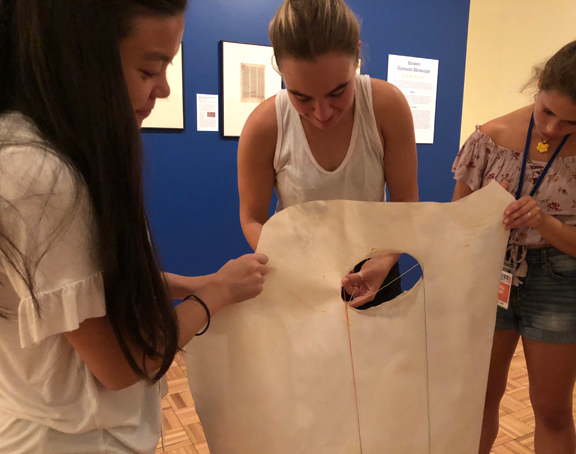 In what felt like an improvised performance, students automatically aided one another, several holding the parchment while another pulled the needle and thread through. Sewing parchment, Samek Art Gallery. Arts First, Bucknell University, August 2018.